Find out the difference and why one might be better for your home. Believe it or not, when the time comes to choose your next garage door, you’ve got options. So many of us have gotten too used to assuming a sectional garage door was the only choice available that other good garage door options, like the single panel (also known as the up and over or swing door). Before you spend one hard-earned dime on a garage door that you’re not certain is perfect for your home, let us help you compare single panel doors to the common sectional garage door. What is a Single Panel Garage Door? Single panel garage doors were all the rage before sectional doors came into fashion. These doors are single, solid slabs that slide up and into the space above your car when they’re opened. They occupy a similar amount of space as a sectional garage door but can function quite differently. Instead of being hung on overhead tracks, most single panel garage doors are hung on a very strong hinge system attached to the jam. Once fitted with springs, this allows the door to swing easily without a garage door opener. On occasion, single panel doors are also hung using a system similar to a sectional door so they can be attached to an opener. Cost. Single panel garage doors tend to be considerably cheaper than a sectional door made from the same materials. When you need to replace a garage door torsion spring or cables, the price will also be lower. Because they’re easier to install and have fewer moving parts, you can save a bundle over sectional garage doors with single panels. Material and design variety. Sure, sectional garage doors come in a lot of styles, but they’re generally limited to options that function well in two-foot segments. The designs of these doors are limited in the same way -- if it needs multiple panels to pull off, your dream door may be difficult or impossible to fit together properly. With a single panel door, you’ve got one giant palette to work with, in nearly any material you can imagine, with no pesky panels to interrupt your vision. Simplicity. 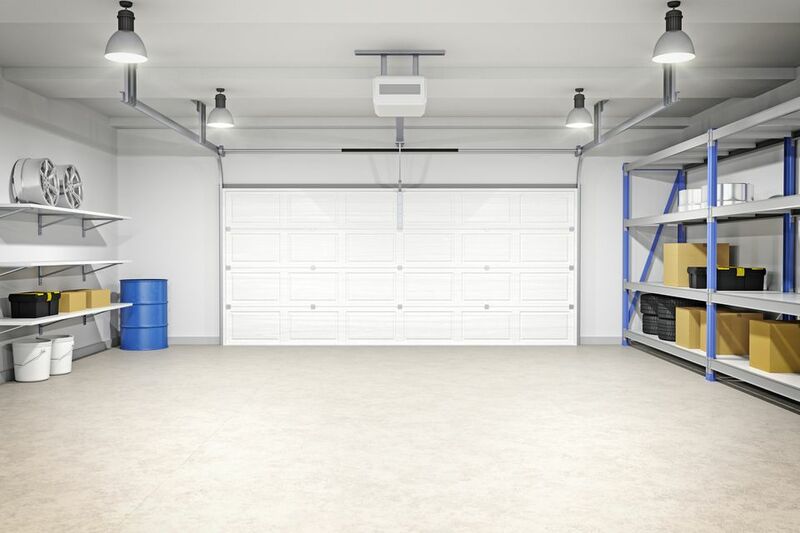 A sectional garage door comes packaged with a huge array of tiny parts, springs, and other bits that make it difficult for a DIYer to install properly. Single panels, on the other hand, have relatively few parts and require less attention in hanging. Fewer parts means less to maintain and, hopefully, fewer bits to break over the long-term. Safety. Perhaps the most important reason homeowners have abandoned single panel garage doors is because of the safety factor. These older doors use extension springs, which can fail catastrophically when not properly maintained. Springs have flown off rusted connectors and gone through drywall, garage contents, and even car windows. Space limitations. Newer homes mean increasingly less space between neighbors, especially in tightly-packed planned communities. The extra few feet a single panel garage door needs to tilt has to come out of the driveway, meaning that you’ll have to park further back while the garage door is opening. If space is at a premium, a sectional garage door is the best way to go. Tolerance to violent weather. Although your single panel garage door can certainly handle some trouble, a sectional garage door may be better in extreme weather. When a single panel garage door fails, it fails dramatically, with the whole door coming down at once. A failed sectional garage door may be dented or crushed in just a single section, providing an easier, less expensive recovery. Garage doors come in a variety of configurations, with a style perfect for every home. When it’s time to choose your next door, consider the single panel garage door if you’re into DIY or own an older home that can benefit from the unique look of these doors.